We are pleased to announce that we are carrying a new book published by Earth Books. 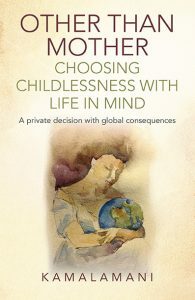 It is available from our website and BookSource: Other Than Mother: Choosing Childlessness with Life in Mind by Kamalamani. What a truly beautiful book. Touching on issues close to the heart – stewardship, legacy and interconnectedness – Kamalamani talks of birthing of another kind. ~ Polly Higgins, International Ecocide law advocate, CEO of Earth Community Trust. Author of Eradicating Ecocide and Earth is our Business.